The Chicago Blackhawks felt like they had to make a change when they fired Joel Quenneville, but they're not seeing any statistical gains under Jeremy Colliton just yet. After an exciting, albeit statistically unsustainable start to the season, it became clear as the second month started for the Chicago Blackhawks that the issues that forced them into a last-place finish in the Central Division last year were as present as ever. Without many other courses of action available, the Blackhawks did one of the few things they felt they could in an effort to create a spark. They fired long-time head coach Joel Quenneville. 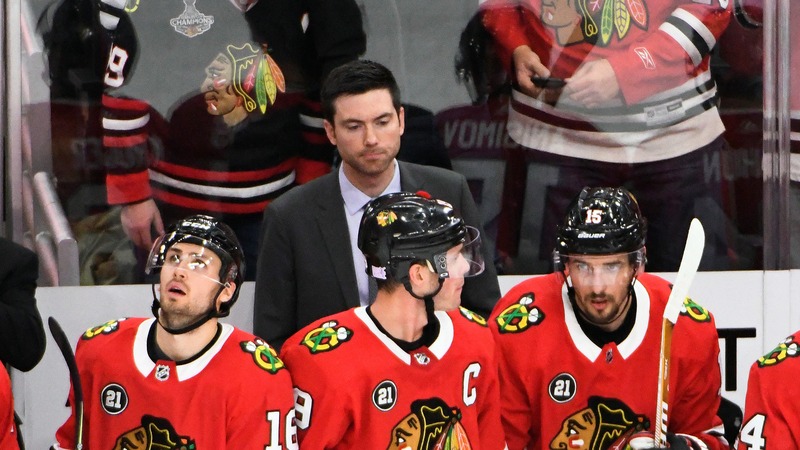 The future Hall of Famer gave way to 33-year-old Rockford Ice Hogs coach Jeremy Colliton and about the only thing that has kept fans from melting down has been the idea that Colliton might freshen things up. Through five games, the Blackhawks aren't seeing the results just yet. Colliton and the players have expressed optimism that the team is moving in the right direction. However, that forward progress hasn't yielded the sort of data that foreshadows a major change. As hockey analytics continue to adapt to a sport that moves quickly and is nuanced, how we choose to predict success is also changing. It's never going to be perfect, because hockey is a game where you can dominate the puck and lose because of a dominant goalie and one unlucky bounce of the puck in the other direction. But at the moment, understanding how a team manufactures the highest quality scoring chances possible has become the foremost indicator of whether a team is good or just getting lucky. So looking at Blackhawks scoring chances for and against as well as high-danger chances for and against is a great way to chart progress. In particular, we look at those numbers at even strength because it takes some of the variable nature of having or giving up the man advantage on the power play. Not to mention, the power play has been another issue entirely for this Blackhawks unit. In Colliton's first game as the head coach, the offense was more productive. [The Blackhawks created 37 scoring chances for at even strength](https://www.naturalstattrick.com/games.php?team=CHI) and 15 high-danger scoring chances at even strength against the Hurricanes that night. Both of those totals were the second most for a game this season. Unfortunately, the special teams let them down again in that game. They created just one high-danger scoring chance (their only chance) with an advantage while yielding three high-danger scoring chances when they were down a man. The goal difference it created wound up being the margin of defeat in a 4-3 loss. Since, the Blackhawks haven't been quite as good at even strength (though they have been generating a few more chances on the power play). In the last four games, the Blackhawks have surrendered seven more scoring chances for opponents than they've created and six more of the high-danger chances that are most susceptible to be converted into goals. Luckily for Colliton and the Blackhawks, Corey Crawford has been the great equalizer in three of those games. He's played brilliantly, helping the Blackhawks salvage a point in extra-time losses to the Hurricanes and Kings and shutting out the Blues for Colliton's only victory in five games. The sample size is small and Colliton shouldn't be judged exclusively based on what we've seen so far. However, the Blackhawks would have loved to see a quick flash of youthful exuberance with their fresh-faced 33-year-old at the helm to help ease the tensions after canning a three-time Stanley Cup-winning coach. They're just not getting that. And given an aging core and the defensive issues that they chose to punt to the future by spending two draft picks on teenage defensemen who are years from making an NHL impact while not signing or trading for a notable defender in free agency, they might not get it any time soon.